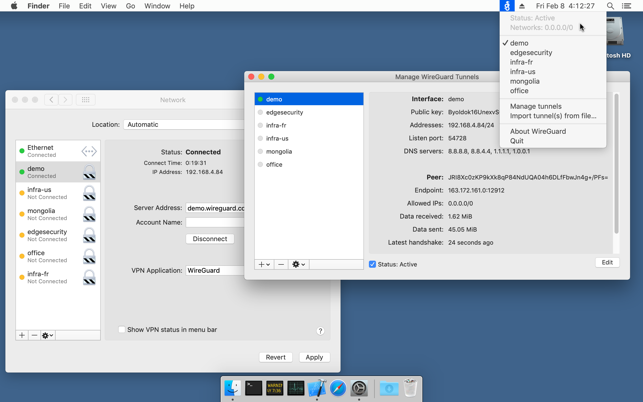 WireGuard is a fast, modern, and secure VPN tunnel. This app allows users to manage and use WireGuard tunnels. The app can import new tunnels from archives and files, or you can create one from scratch. It is currently undergoing rapid development, and we are listening to our users in implementing new and exciting features. Please visit wireguard.com for a summary of the WireGuard protocol and how to set up your own WireGuard server for use with this app. It is now possible to view the tunnel connection log in real time, which should help with debugging various configuration errors and connectivity issues. There is now much better support for systems that use multiple login users. The code base has been migrated to Swift 5, which should decrease the size of the app. Numerous small bugs have been fixed. It works great, but if you switch users and open the app, you can't open it because it's already open with another user. If you quit the app in the other user and open it in another, all of your tunnels disappear in both users. That means all your tunnels are lost until you add them again, in every user. If you stay connected to a tunnel while switching to another user, you're still connected to that tunnel, forcing you to go back to the first user and disconnect, then switching users. My feature request is for the app to work on a per-user basis. Tunnels and settings should be user-specific. Switching to another user should disconnect the first, and connect the other to its user-specific tunnel that on-demand is on. I've been using wireguard-go on Mac OS Seirra from the command line. I had to update to Mojave to us this new wireguard app All my settings for wg-quick are in /usr/local/etc/wireguard and I have no idea what create/import tunnel means. It was already working fine from command line and now I'm regretting having installed this GUI version. I'm sure once I figure out how to feed the config I have into it then things will work fine but till then this is very frustrating. This project is really well documented, and a middle-aged script kid like me could even figure out the CLI. The native Mac client seems light, fast and stable, which is consistent with everything I've seen from this development team so far. Well done, Edge Security.